Hello, Janet here with a quick clean and simple one layer card. As soon as I saw the Cabana Tiles die in the Stamp Of Approval Tropically Yours collection I knew I would be making a lot of cards with it. There are still some SOA boxes in stock – but they are at a limited amount so don’t wait too long! There are 6 stamp sets and one die set in this Stamp Of Approval box but I only used the Cabana Tiles die, one sentiment from the Fearless Pursuit stamp set and one ink by Catherine Pooler Designs. I have kept all the dies connected so I could run them through my Diecutting machine together. I used a tan embossing mat so the dies would emboss into the card and not cut the card. This can be done on all Diecutting machines – just make sure you have the right ‘sandwich’. I ran the die through my Cuttlebug twice so the whole front of the card would have this pattern. Making sure that the die went over the edges so it would look like a continuous pattern. 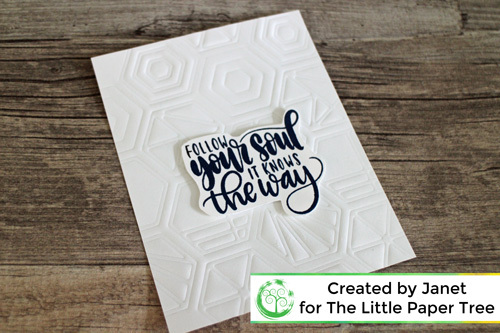 On another piece of Neenah card I stamped the sentiment ‘Follow Your Soul It Knows The Way’ with Juniper Mist ink and fussy cut out the sentiment leaving a border. I adhered this onto my card with foam squares and mounted it onto a pre scored card base. And that’s my card for today! Check out what the Design Team have been making with this die too! Make sure you tag us (#thelittlepapertree) and Catherine Pooler (#cpstampofapproval) with your makes from this great SOA box on social media. Also, share your creations in the The Little Paper Treehouse Tribe group over on Facebook!